New cPanel feature Greylisting enabled on all Servers. 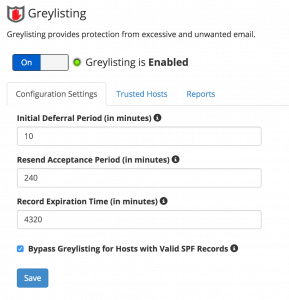 With the recent upgrades to cPanel 11.50 that have been done across our full range of servers, we are pleased to announce some fantastic new functionality called Greylisting that will dramatically cut down on the amount of spam delivered to your email mailboxes. Firstly, emails sent with a valid SPF record (Sender Policy Framework) are immediately delivered. If an email arrives without a valid SFP record and isnt from a sender already accepted, then Greylisting works by deferring this emails by returning it to the sending server with an message that effectively says “I’m busy at the moment, try again in a bit”. All valid email sending software (MTA’s) will automatically retry sending the same email many times often starting a few minutes after the initial send and lasting for several days until it times out. Almost all spam sending MTA’s will simply give up and move to the next email address. Other than a very short delivery delay the first time someone new emails you, it’s generally unnoticeable. Greylisting is enabled by default for all domains on all servers at Havenswift Hosting. You can disable/enable it on a per-domain basis in your cPanel interface. Look for this icon in the E-mail section – we very strongly recommend that you keep this enabled !